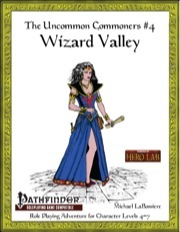 Wizard Valley is the fourth book (of seven) in The Uncommon Commoners campaign series. In this semi-epic campaign, the uncommon commoners will fulfill their destiny. Or die trying. Or both—if their destiny is to die trying. 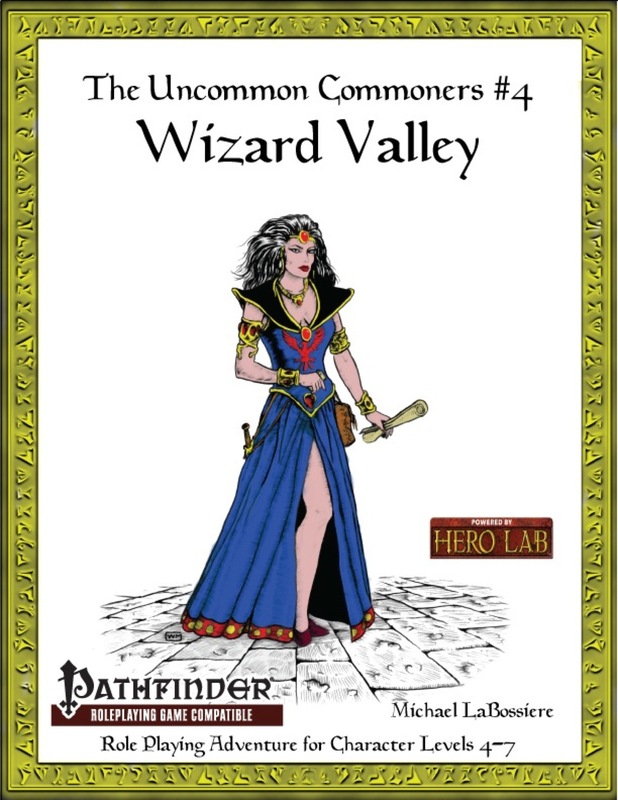 The Uncommon Commoners #4: Wizard Valley is a Pathfinder Role Playing Game compatible adventure. It is intended for a party of 4th-7th level uncommon commoner characters. While the adventure is written to be humorous and fairly light, it is also designed to be suitable for serious game play. New Monsters (goblin chicken, ogre pigs, and the plant head template). New Magic Items (Dunce Cap, Granny Smith’s Airy Apple Crisp, Plant Head Pie, Scary Robe, Sewing Kit of Mending, Roy the Wizard’s Hat, Staff Charge and Wizard’s Pipe). New Spells (Plant Head and Think). 71 pages of adventure (includes maps)!